We have a great selection of American made deerskin gloves and other motorcycle gloves. Deerskin is one of the most difficult leathers to work with, both in it’s tanning process, and in the making of leather goods. This, and limited availability, prevents it from being a leather that can be stamped out and sewn into products by the millions using inexperienced labor and many common mass production methods. When done properly however, it produces one of the strongest, softest, most durable, and comfortable gloves you can wear. 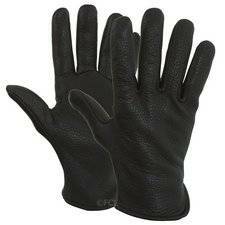 A properly cut deerskin glove has stretch width-wise and very little stretch length-wise. This means a snug fitting glove that will expand with your hand when you make a fist or grip something,but the fingers won’t stretch or become floppy. The physical structure of deerskin leather is different than other types of skins. It’s elongated interwoven fibers give it an extremely high shear strength and abrasion resistance. The spaces between the fibers make the leather soft and comfortable over a wider range of temperatures than others. In other words: cooler in the warm weather and warmer in the cold weather. The combination of a naturally superior leather,tanned, cut and sewn by Experienced crafts people using age old processes, results in a product that truly “fits like a glove”.